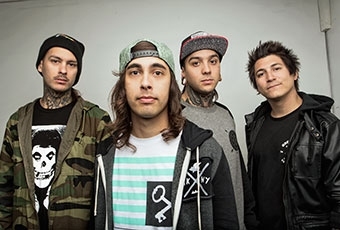 Pierce The Veil have announced they will release their very first documentary This Is A Wasteland on November 11th. Fans will discover an all-access look at life on the road as the San Diego, CA quartet embark on their worldwide tour. Pierce The Veil chronicles the extraordinary life of international touring through exclusive interviews, previously unreleased live performance footage, travel experiences, and everything in-between. This Is A Wasteland will be available digitally via iTunes, and the physical region free DVD comes packaged with a hard bound 28 page book and a bonus copy of Collide With The Sky CD. You can watch the trailer for the documentary below.